The wait is over! 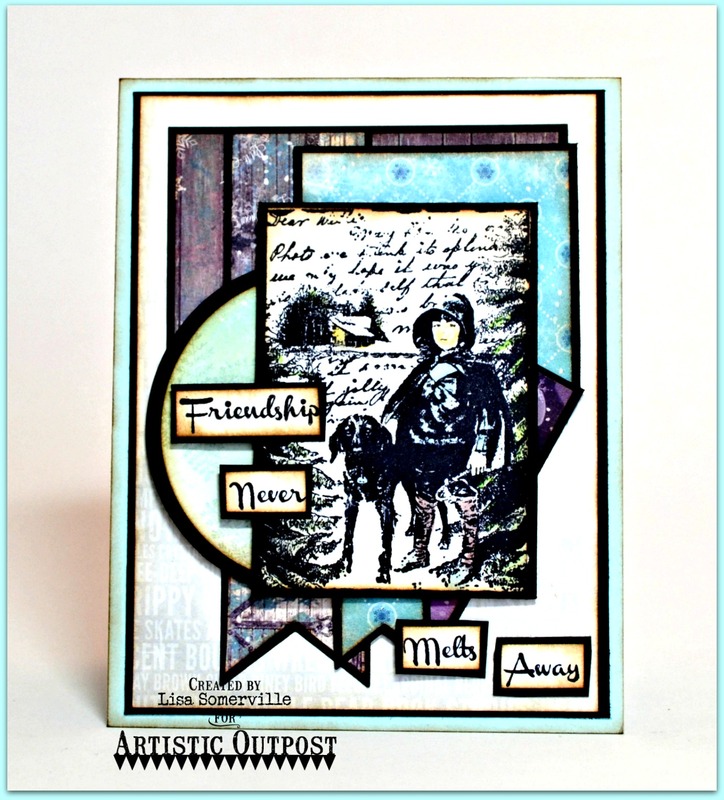 I'm excited to share with you that Artistic Outpost has released two new stamp sets, one background stamp and 4 single stamps, click here to see the new releases! Keep reading below to see how you can win a $15 Artistic Outpost Gift Certificate! 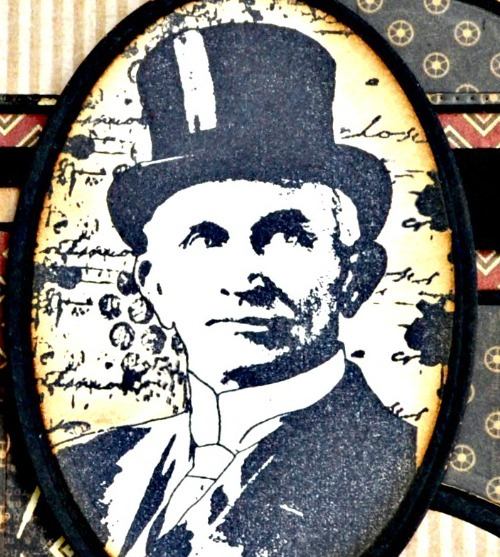 Before I share my cards, for those of you looking to add masculine stamps to your collection, you NEED to check out the new Hat's Off and Hats Background stamp sets! Here's a peek at one of the cards I'll be posting on my blog soon that uses the Hat's Off and Generation Redux stamp sets! Today, I'm sharing two cards created with two of new stamps sets. My first card uses the Skating Emporium stamp set, along with dies from AO's sister company, Our Daily Bread Designs. To create my card, I masked the words on the skating scene from the Skating Emporium set with eclipse tape, inked the stamp with Ranger Black Archival, removed the tape and stamped onto White card stock. I created a double mat using Oval Dies to mat the stamped image. The sweet children from this set are stamped in Black Archival on White card stock, I sponged with Distress Inks to add color, then sponged the edges with Gathered Twigs Distress Ink. The sentiment was masked and stamped onto tags that were die cut using the ODBD Mini Tags Dies. 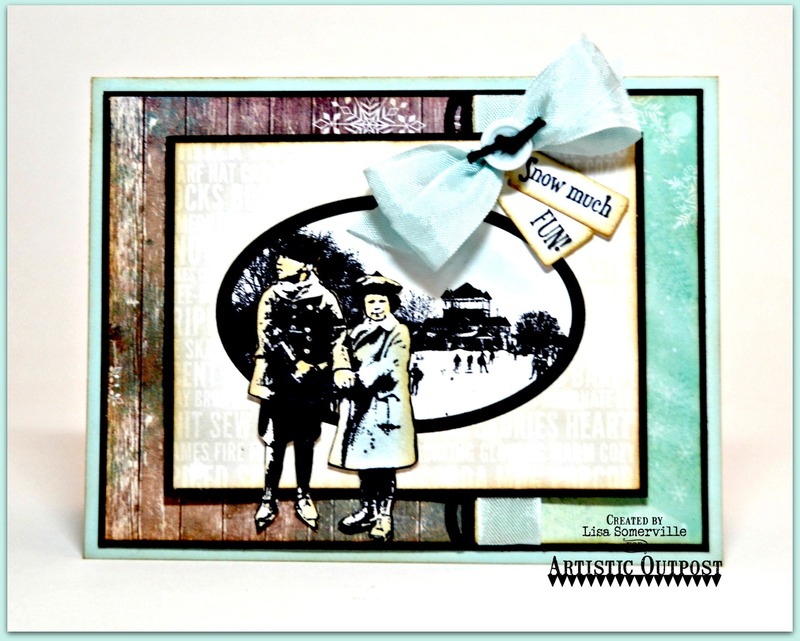 Using Soft Sky ink, I added stamped snowflakes to the stamped tag and pattern paper panel. To further embellish I added a border die using the ODBD Beautiful Borders Dies, Seam Binding,a button tied with Black twine and Dry Glitter to the pond. My next card uses the Skating Emporium and Winter Walk stamp sets along with the ODBD Pennants Die, Matting Circles Dies and Circle Ornaments Dies. The collage image from Winter Walk is stamped in Black Archival on White card stock, then colored using STAEDTLER Watercolor pencils, blending the colors with Gamsol. Using the snowflake from the Skating Emporium set and Soft Sky Ink, I added snowflakes to some of the pattern paper panels. The sentiment is from the Skating Emporium set, is stamped in Black Archival on White card stock, all pieces are sponged with Gathered Twigs Distress Ink. To make the words pop, I cut them and mounted on Black card stock, then added them to my card as shown. Just for commenting on the Design Team Blog Posts, you have a chance to win a $15 Artistic Outpost Gift Certificate, good towards the purchase of AO Stamps. You have until January 23, 2015 at 10:00 PM CST to leave a comments on the participating designers blogs for a chance to win! Three random winners will be selected from the comments left on the designers blogs, the winners will be announced on the AO Blog on January 24, 2015, be sure to check back there to see if you have won! Love, love, love your cards. You used two of my favorite of the new stamp sets. Your use of color and layering are excellent. Thanks for sharing your ideas and talent. Thrilled to see new Robyn designed AO stamps! Your cards are beautiful! I love the papers and of course the sweet children! Very very nice! Absolutely wonderful stamp sets and your cards are outstanding. I love the layouts you have used and the stamps are fab! Gorgeous! I adore this color scheme! Lisa, your cards are always gorgeous and the layers and combination of papers PERFECT. Love the way you combined Skating Emporium and Winter Walk! Amazing samples, always so perfect! You have an amazing style. Your sneak peek leaves me longing. Your first card is so well put together...kids in front of the scene, love it. Your second card has a wonderful layout design featuring your artwork and sentiment. I just love your layouts and these stamps are wonderful! Great job. So pretty and full of colorful backgrounds! The framed skating scene looks fabulous as a backdrop to those kids. Lovely cards as always, Lisa! Lisa love both of your cards and sweet images also you have some awesome layouts on both. beautiful cards, I love the skating emporium card-gorgeous! Love love! Thanks for sharing your work! Great stamps, and great ideas!! Awesome cards - love the colors !!! I really like the details and toe colours of your cards!